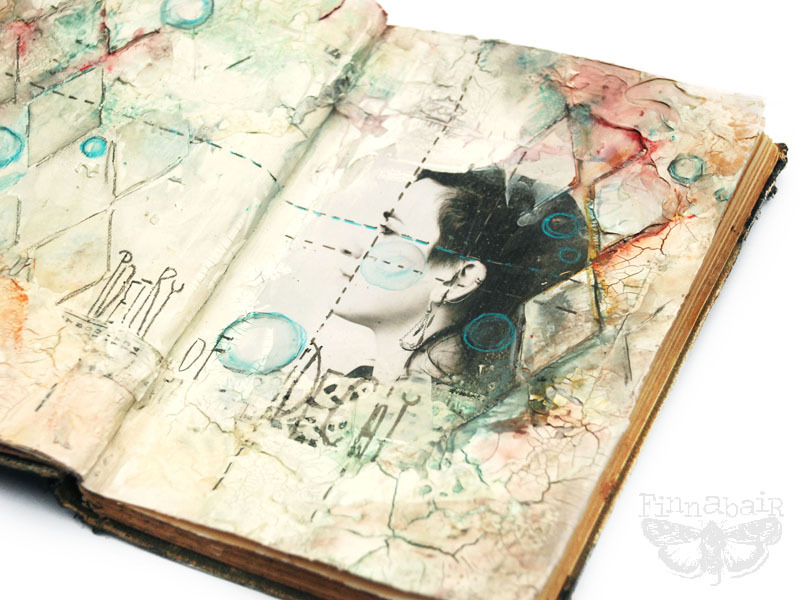 I'm back with my next Art Recipe - this time art journal pages - in the last days I had a couple of ideas for my journal so why resist? "Poetry of Decay", shown below started as an idea of creating textures which will be both light in colors and pretty heavy in texture giving the impression of fading, disintegration and deconstruction. As always - pages are all emotional, telling stories which are somewhere close to the surface, willing to be told before they will suffocate me. I guess I'm not going to start write poetry or short novels (too late for that - I should have started 15 years ago!) 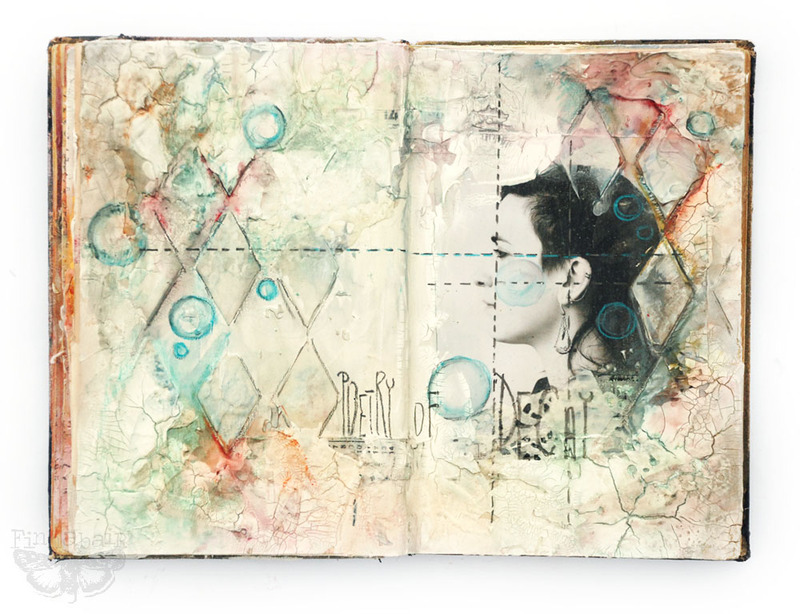 so my art journal and collage are the options which are left! Subconsciously, I came back to the color combination which I somehow relate with longing, feeling empty or deprived - those of you who were playing with "Cold Country" collection from 7 Dots Studio should find a relation with ease. I was trying to show full palette of opposite feelings, hot and cold ones which can be hidden deep in us and be present in the same time. I'm very pleased with the effects of experimenting with a mixture of Art Basics Modeling Paste and Art Extravagance White Crackle Paste. I tried to get effect of crushed, peeling walls and I guess I succeeded! I love how the photo blended in the whole composition too - working with texture mediums will always be on my top list. Honestly - these crackles and modeling paste textures which are similar to old plaster made my heart sing! Color combination wasn't a simple one as I was trying to find the right palette for quite a while. Finally I've used 3 different colored mediums: shimmering sprays from Lindy's Stamp Gang, Art Ingredients Mica Powders and Watercolor Pencils. I hope I will find more time to play with this photo - this is a great show which we've made years ago for one of my collage projects... and it is just perfect to play with. This time I covered it with a coat of Art Basics Clear Gesso - for protection and to paint on the photo with watercolor pencils. I love how it finally turned out. The whole project, explained step-by step is below - have fun experimenting with these techniques! 1. 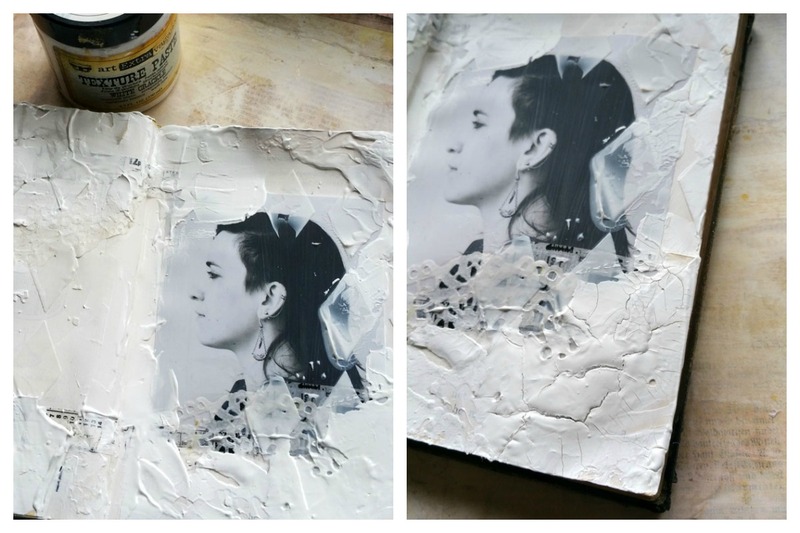 I started with putting 2 coats of Art Basics Heavy White Gesso on the pages of my vintage book. This stopped my sprays from soaking through the paper. Next I glued the chosen image on one of the pages (I used Art Basics Soft Matte Gel) and I coated the photo with a single, smooth coat of Art Basics Clear Gesso - to change it into matte, easy to paint surface. I dried the pages and I was ready to continue. 2. Next i picked up some scraps of paper, some washi tape and paper doily and I glued these in the selected places of my composition to add some nice texture. I used Art Basics Soft Matte Gel again. I dried the composition with the heating tool and moved to the next step: adding dimensional Harlequin pattern. I used Art Basics Modeling Paste which I applied with a palette knife through the stencil. I added a bit of extra of the Modeling paste in the corners of the composition to create more dimensional look of "old plaster". 3.Next I moved to Art Extravagance White Crackle Paste which was applied more in the middle of the page, overlapping the photo and Modeling Paste pattern. I was hoping to create really weathered, vintage look. I left the book in the dry, warm place to speed up the cracking process. 4. When my project was dry again - and nice crackling appeared I was ready to add the color. First I sprayed The pages with Lindy's Sprays - shades of gray, yellow and A touch of pink. after drying I also added a bit of patina look spraying Art Ingredients Mica Powders mixed with Water: Teal and Rust. I dried the project completely. Last step was adding some touches of color with Watercolour Pencils (I used new Prima - soon available in the shop!) and mixing them a bit using water brush. Finally, using very soft pencil, I drew lines, bubbles and added text. I colored the bubbles with a touch of light blue and turquoise pencil. Voila! Ready! I think using watercolor pencils is one of my favorite journaling techniques in the last months - did you try it yet? If not - beware - it's very addictive! 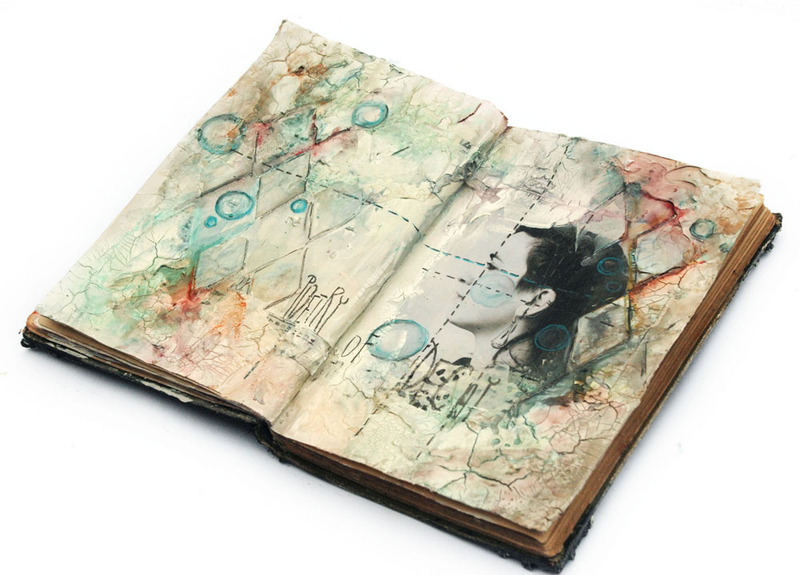 And here you can find all the products listed - available in our Mixed Media Place Shop! I hope you enjoyed - and got inspired to play a bit! Your art is very inspiring to me. Thank you for sharing. Bardzo mi się podobają te przerywane linie dzielące zdjęcie na części, świetny efekt. Your page is beautiful. 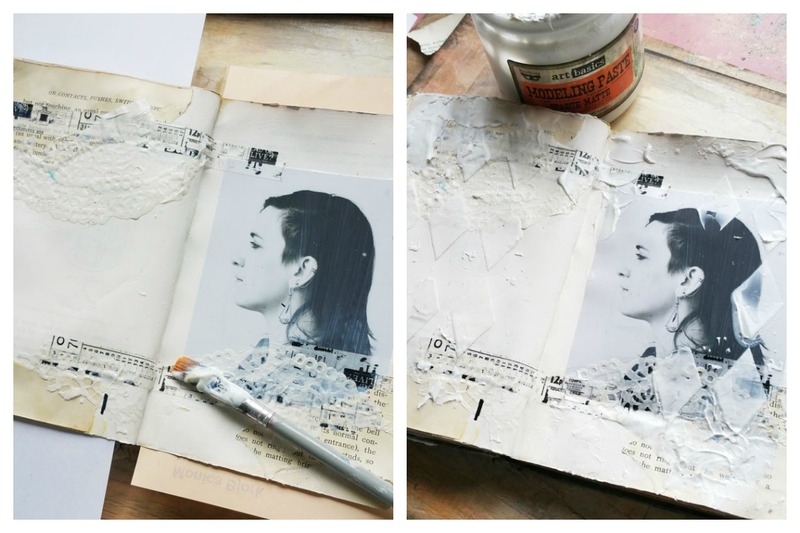 I was wondering if you think the clear gesso would protect a journal cover like it protects your page; as the cover endures more handling. As always, beautiful art! 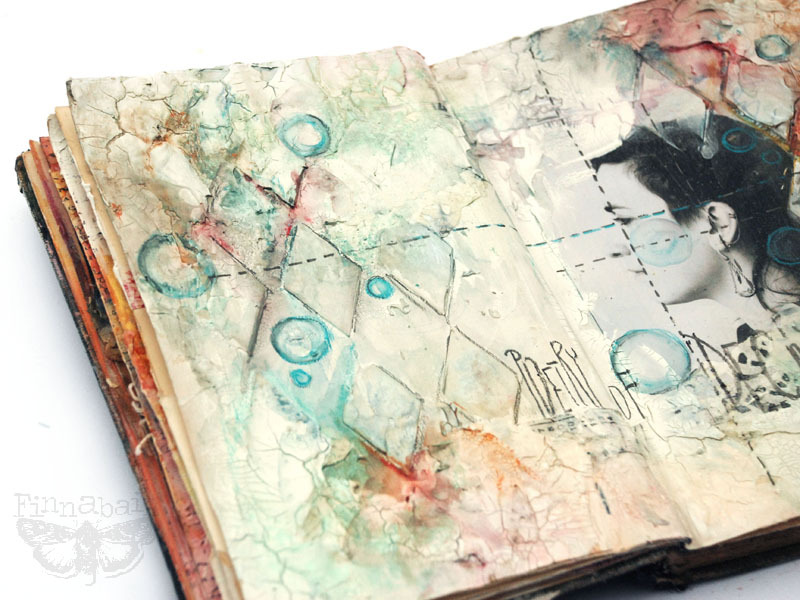 The two pages in your art journal are wonderful - the colors and textures. I use all of your products and have always had perfect results. Thanks for sharing. Fantastic ! Love all the texture ! Absolutely beautiful. I love your work, and this is certainly no exception. TFS the directions, too. I want to learn to do this myself. I really love this page. I think you've achieved completely the decay look. It was sutil and, at the same time, corrosive. absolutely amazing, thanks for the fantastic tutorial! I'm blown away by this piece of art. Truly magnificent. Thanks for the inspiration! This project is amazing! Thanks for sharing!